Amitabh Bachchan asking Shah Rukh Khan for bonus for Badla is basically every employee! Amitabh Bachchan asked Shah Rukh Khan for a bonus and also took a dig at him, calling him 'Raja Dhiraaj' (his nickname King Khan). Bollywood legend Amitabh Bachchan has continued his playful rant on Twitter with superstar Shah Rukh Khan. After demanding acknowledgement for the "silent success of Badla" and a party for the film, Amitabh Bachchan has now asked SRK for a bonus! he also took a dig at Shah Rukh, calling him 'Raja Dhiraaj' (his nickname King Khan). Amitabh Bachchan in his fluent Hindi said on Twitter, "मान्यवर , राजा धीरज ( KING KHAN ) ,,, सुनने में आया है की "बदला" फ़िल्म आपके फ़िल्मी career की , सबसे बड़ी hit फ़िल्म है ; । तो भाई साहेब , company में जब सफलता मिलती है, या जब कोई अच्छा काम करता है , तो तोहफ़े के रूप में उसे इनाम दिया जाता है । तो लायिए , हमारा bonus ". The English translation of what Amitabh Bachchan has said could read, "Respected King Khan, we have heard that Badla is the biggest film of your career. So Brother, when your company makes profits, when someone does good work, he is rewarded. So, where is my bonus?" Isn't this how each one of us would like to talk to our boss or the human resource professional in office during appraisals or a special performance? So, Amitabh Bachchan asking Shah Rukh Khan for a bonus for Badla is basically every employee! Badla is a film produced by Shah Rukh Khan's production company Red Chillies Entertainment and directed by Sujoy Ghosh. Starring Amitabh Bachchan, Taapsee Pannu and Amrita Singh, it is the official remake of the Spanish film The Invisible Guest. Badla released in India on March 8, 2019. 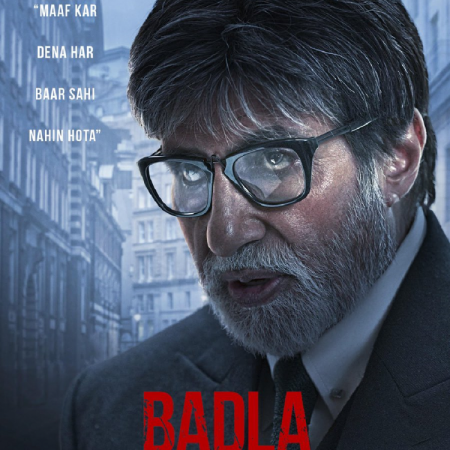 Made on a budget of Rs 10 crore only, Badla has managed to collect over Rs 100 crore at the worldwide box office. Ramesh Bala, a consultant and entertainment industry tracker, tweeted the latest Badla box office figures on April 12, saying, "BADLA stays strong! Week 5 - Fri - ₹30 lacs, Sat - ₹55 Lacs, Sun - ₹72 Lacs, Mon - ₹20 lacs, Tue - ₹20 lacs, Wed - ₹20 lacs, Thus - ₹20 lacs, Total - ₹2.37 Cr. Week 1 - ₹38 Cr Week 2 - ₹29.32 Cr Week 3 - ₹11.12 Cr Week 4 - ₹5.25 Cr Total - ₹86.06 Cr GBOC - ₹101.55 Cr." Seeing these figures, one can say Amitabh Bachchan has rightfully demanded to be recognised for the success of Badla! Take a look at the conversation between the two legends on Twitter over the past few days. Amitabha Bachchan had demanded on April 9, "... about time someone started talking about this silent success .. !! because neither the Producer, nor the distributor, nor the on line Producer, or any else in the Industry, in general .. has even spent a nano second to compliment the success of this film #Badla .. thk u." To which, SRK replied, "Sir hum toh wait kar rahein hain ki aap party kab de rahein hain hum sabko! We r waiting outside Jalsa every nite!" Big B straightaway hit out at SRK, saying, ""oye .. फ़िल्म में काम हमने kiya , produce आपने किया , promotions में निस्वार्थ योगदान humne diya , अब party भी हम दें !!!??? .. outside Jalsa every night koi nahin aata!!" Shah Rukh Khan said in jest, "Sir film aapki hai…acting aapki hai…Hit aapki wajah se hai…aap na hote toh film hi na hoti. Toh party…bhi??" To which, Amitabh Bachchan replied asking for a bonus for his performance!